« ‘High Fidelity’ – why did it fail so spectacularly? Last night marked the reopening of the newly-refurbished Kings Head Theatre in Islington with the first show in its new season, which also marks its new beginning as a fully-fledged producing house. 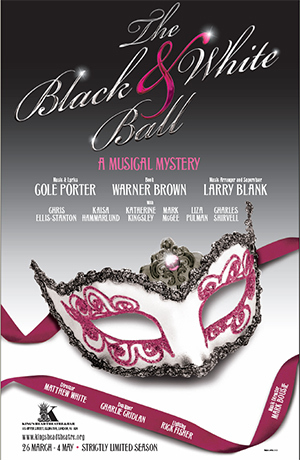 Black and White Ball is billed as “the new Cole Porter musical”, but is in fact a ‘collaboration’ between Cole Porter and Warner Brown, alebit one where the latter has written a new book that incorporates the music of the no-longer-alive Cole Porter. This sounds like an intriguing project to me, so I am keen to see what the critics have to say… It hasn’t yet been reviewed everywhere (nothing from the Guardian or Independent yet) so if they publish something later, I will update this post. “There’s not much tension in the story or surprise in its solution, but any disappointment is offset by stylish performances from Kingsley, Ellis-Stanton and, especially, Mark McGee as a drag-queen who combines human slyness with musical energy.